Historically the site has been used for manufacturing and vehicle maintenance purposes. The identified contamination issues were consistent with previous usage of this nature. Over the years the site has been used as a woolen mill, a boot and shoe manufacturing works and additionally as a vehicle repair and servicing garage. The site occupies approximately 4 hectares. Resolve contamination issues in order to protect receptors (address the source and indirectly pathway contamination issues to protect the identified groundwater and human health receptors) and render the site suitable for the proposed development. Provide a stable development platform (to agreed levels and gradients) for subsequent construction of the proposed development and associated infrastructure. Satisfy requirements of the Local Planning Authority and the National House Building Council (NHBC). The identified contaminants of concern were Total Petroleum Hydrocarbons and Polyaromatic Hydrocarbons. The outline proposal was to enable maximum re-use of material on site. Professional Remediation chose advanced stabilisation to effectively treat identified hydrocarbon contaminants of concern and to enable reuse on site, with the attendant cost savings. The agreed treatment strategy was to produce a chemically and physically stabilised treated material suitable for reuse on site (as a substitute for imported fill material). The strategy involved the ex-situ stabilisation of approximately 300m3 of contaminated soils. 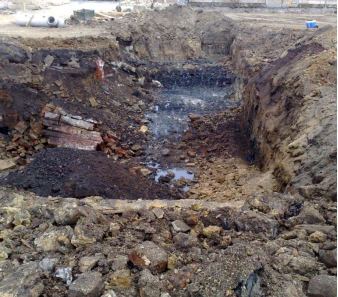 The methodology involved treating several stockpiles of contaminated soils excavated from the site as a whole (as identified by Lithos). These stockpiles were varied in nature and composition necessitating a treatment strategy incorporating a suitable E-Clay formulation for chemical stabilisation / immobilisation of hydrocarbon pollutants, in combination with cementitious additives to provide the requisite physical stabilisation.